I’m going to take a shot in the dark & say the title of this blog post intrigued you just a little bit. Go ahead…you can admit it. I bet you were expecting a LUSH Easter Haul blog post, right? 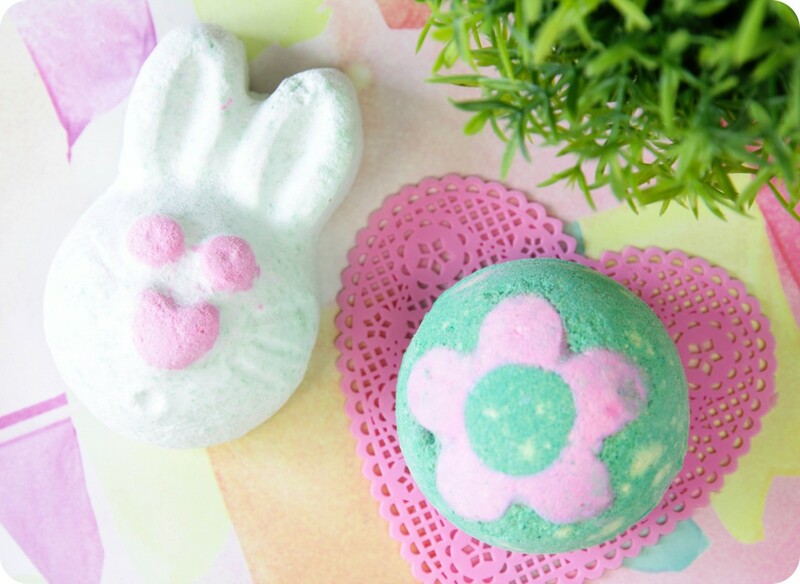 Everyone has been raving about the Easter 2015 collection, I’ve seen Instagram photos and Twitter pictures making the rounds since last week Wednesday when LUSH South Africa added a few collection items to their online store. Well…up until about 3 days ago, I also expected to feature only the Easter 2015 collection items. Even as I placed my order with Chantelle (we take turns to place LUSH online orders, because we like to split the delivery costs), I still thought everything categorised under the ‘Easter’ tab was part of the Easter collection. WRONG! 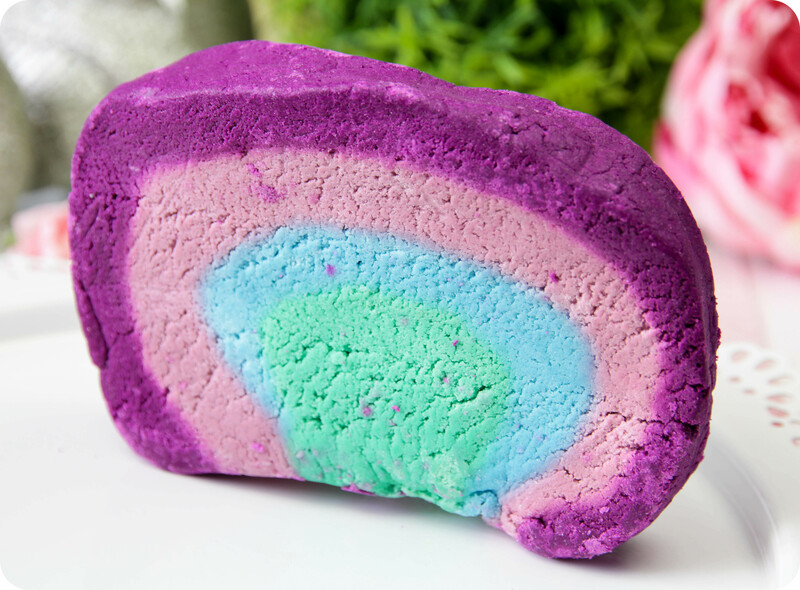 Turns out Ultraviolet Bubble Bar AND Bubblegrub Bubbleroon are both actually part of the Mother’s Day 2015 collection… Far out, right? I’m not exactly sure why LUSH categorised these under the Easter tab in their online store, but I am guessing it might be because this is all we’re getting from the Mother’s Day collection this year. For the record, though, everything is sold out online – most of the collection sold out within a few hours! You can probably still find most of the Easter & Mother’s Day goodies in-store at Gateway, V & A Waterfront, Cavendish and Canal Walk, so if you live in Cape Town or KZN, you’re in luck! Good grief, how many times did I say “Mother’s Day” and “Easter” in that first paragraph…? Now, before we get started – I have GREAT news for my fellow Gauteng-based LUSH-aholics: LUSH is opening a store in Dainfern Mall (Fourways area) in June this year! Dainfern Mall is apparently a brand new mall, that is being built as I type these words… Ok, not true – I’m writing this blog post at 22h00 at night, and I doubt they’re building the mall at this hour. But you get the gist of what I’m saying, right? I can’t tell you how excited and happy I am about this, we have waited way too long for a Gauteng store! Now I can walk into a LUSH store whenever I need a ‘pick-me-up’ and take a big ol’ sniff of that heavenly-scented air (if you’ve ever been inside a LUSH store, you’ll know what I’m talking about)… *sigh* Fourways is a good 30 to 40 minute drive from where I live, but it will be worth it. Let’s take a look at the goodies I picked up from both the Easter 2015 and Mother’s Day 2015 collections. I didn’t order every single item from the collections but received a little parcel from LUSH yesterday (take a look at my Instagram photo in the right-hand column of my blog) – they very kindly sent me a few items from the collections to inform me of the new store opening in Johannesburg. Secret Garden Bath Bomb wasn’t available in the online store, but since LUSH sent it to me, I assume it is sold in-store. For interest sake, only Secret Garden Bath Bomb and Carrot Soap mentioned in this blog post were sent to me by LUSH (everything else was bought by moi, for moi). I wanted to give you a short review of at least 2 of the products I bought, so I’ve tested ‘Hoppity Poppity’ and ‘Bubblegrub’ so far. I bought ‘Fluffy Egg’ (which was also part of the Easter 2014 collection) last year, so I can give you a solid review of that one too. As for the rest of the collection, I’ll give you my first impression of the scents – how does that sound? 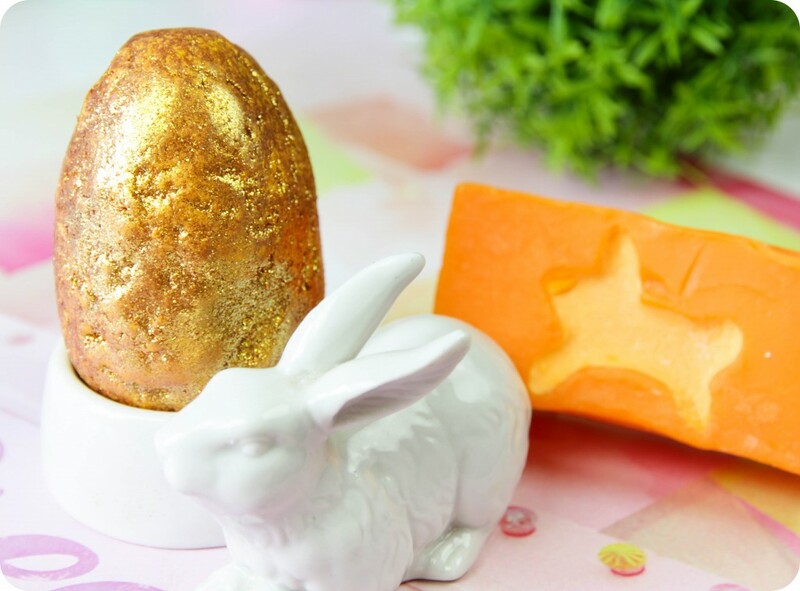 Golden Egg Bath Bomb Melt (R 55,00) – The egg is covered in gold glitter, so obviously I was going to pick this one up. Apparently you get the best of both worlds with this product, it is composed of a Bath Melt (cocoa butter and sweet orange oil) outer shell and Bath Bomb inner core. Interesting, right? As for the scent of this golden orb, it smells quite similar to the ‘Honey I Washed The Kids’ soap – a comforting, yet fresh caramel & honey scent. Carrot Soap (R 39,50) – In all honesty, I’m not the biggest fan of solid soap bars, I prefer a liquid hand soap or shower gel. I haven’t used this tropical scented soap as yet, but from what I’ve read online, it features a refreshing combo of carrot-, buchu-, lemon-, coconut- and bergamot oils plus the little rabbit leaping through the middle is solid cocoa butter. I’ve sniffed this bar a few times & I would describe the scent as fruity with a sherberty twist. Hoppity Poppity Bath Bomb (R 38,50) – I expected this to have a creamy or Snow Fairy-ish scent, but the scent is actually quite herby. Hoppity Poppity starts to pop and fizz as soon as it hits the water, bobbing around the surface oozing white and pink foamy goodness. It definitely packs a punch in terms of fragrance, and filled my bathroom with a floral, yet herbal aroma. This bunny-shaped Bath Bomb contains lime oil, violet leaf and lavender – all combined give this cute little hopper a fresh, yet relaxing fragrance. And as if the adorable design wasn’t enough, he also contains popping candy which crackles and pops under the water surface. Secret Garden Bath Bomb (R 42,50) – This beauty is part of the Mother’s Day collection and I am quite familiar with it since I bought it last year. I really like the look of this Bath Bomb, it’s super bright and cheerful. The scent of Secret Garden reminds me of a freshly picked bouquet of flowers, it contains rose absolute, wild orange- and rosewood oils. Upon impact, this Bath Bomb fizzes and froths releasing vibrant green and bubblegum pink foam…and the grand finale? A secret garden of rose petals inside, these float around on the surface of the bath water. I find Secret Garden to be relaxing and indulgent, plus it leaves the skin feeling soft and moisturised. 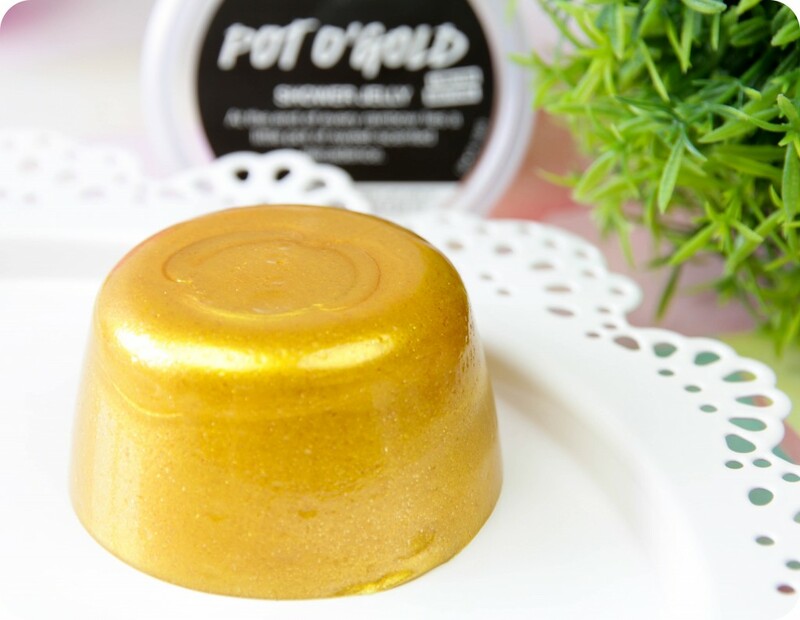 Pot O’ Gold Shower Jelly (R 65,00) – This is probably the product I was most excited about! Why, you ask? Well…because it is basically a butterscotch-scented shower jelly crammed full of gold shimmers and glitters. What’s not to love, right? This jelly-textured body wash is packed with fresh pineapple juice, sweet orange oil and vanilla absolute – I’m not exactly sure where the melted brown sugar scent comes from, but it smells absolutely delicious! The above photo does Pot O’ Gold absolutely no justice, it is a magical mountain of glistening gold shimmer. Trust me, you need this in your life – if not because of the delectable scent, then definitely because of its beauty! So how do you use a LUSH Shower Jelly, you ask? There are a few ways: You can either pinch a small piece off and rub it directly onto the skin, the amount of lather it creates will depend on the size of the piece you’re using. I personally don’t like this method, as it doesn’t create much of a lather and it usually slips out of my hand. Or you can massage the whole Shower Jelly on a bath lily, shower puff or exfoliating glove to create a creamy lather. This is my preferred method, as I find it to be quick, easy and economical. I also find the method of pinching a small piece off and then rubbing it into a bath lily to be wasteful, as it often ends up on the shower floor and sometimes even down the drain. Top Tip: Use this wibbly wobbly jelly as a bubble bath product – rub a small piece between your hands under a running tap to create luscious, glistening bubbles. 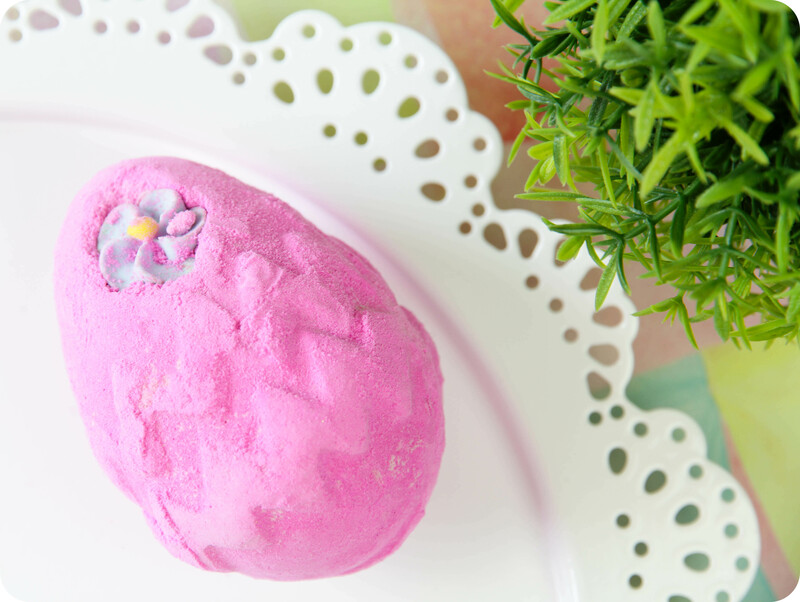 Fluffy Egg Bath Bomb (R 42,50) – If you like the LUSH Snow Fairy scent, then you will love Fluffy Egg! I personally adore the Snow Fairy scent, it reminds me of candyfloss and bubblegum (which were 2 of my favourite things when I was a teeny tiny little girl). Fluffy Egg is a bright pink Easter egg-shaped Bath Bomb adorned with a beautiful floral decoration. It fizzes away quite quickly and turns the bath water into a beautiful vibrant pink shade. I don’t consider this Bath Bomb to be egg-ceptionally (see what I did there?) moisturising, but I love the fragrance and will repurchase it each & every year. 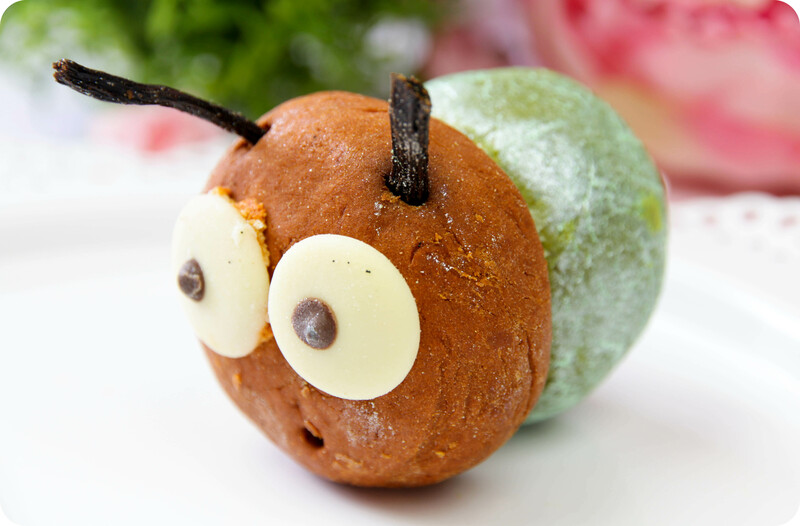 Bubblegrub Bubbleroon (R 48,50) – First of all, how cute is this little guy!? He is actually based on the children’s book ‘The Hungry Caterpillar’ and although I feel sorry that he only has 2 parts to his body (usually a caterpillar is much longer, right? ), my sympathy didn’t last for too long because I didn’t think twice about crumbling him under my running bath water. This little critter created mounds of velvety bubbles, and the scent of a creamy caramel dessert lingered in the air. He contains a mix of sandalwood oil (nourishing) and tonka absolute (eases muscle pain), plus skin softening shea butter is used to sandwich his head and body together. Ultraviolet Bubble Bar (R 75,00) – This one is a whopper and I must admit, the look of it fills my happy tank to the brim! It looks like a very interesting rainbow, and smells musky and floral with a little bit of sweet. As mentioned in the beginning of this blog post, I have not tested Ultraviolet out as yet, so I can’t give you a proper review on the amount of bubbles it creates, nor whether it’s particularly moisturising. I have seen a few Instagram photos and 1 YouTube video, and it looks like it turns the bath water into a bright purple shade. It contains a combo of ylang ylang oil, violet leaf, rosewood and jasmine & apparently also features snowflake lustres – eeeeep! As mentioned, this is a gigantic Bubble Bar so 1 of these will give you at least 3 or 4 good quality baths. Ultimately, the LUSH Easter 2015 collection is a great alternative for those who don’t appreciate chocolate gifts for Easter. I would definitely choose one of these over a chocolate equivalent any day (unless it’s a Lindt coconut truffle)! As for the Mother’s Day collection? Go ahead, spoil mum – she’s worth it! They all look so AMAZING!!!!! What can I say….. I just want to continue reading your blogs. Lush Lush Lush Lush Lush finally a store in JHB (wagging my finger at Lush). super excited and although I cant always stomach the smell of a Lush store. I will because its here and its close and I dont have to get on a plane or drive 2000km for goodness sake. I love all these products. I hope my mom and sister enjoy them I got them some of these for easter as appose to choccies. Gaaaaaw, I LOVE the smell of a LUSH store…it’s so intoxicating! I managed to get Bubbleroon, but somehow missed the ultraviolet bubble bar…*sigh* Oh well, maybe next time! I used Golden Egg lastnight, it was fantastic! It really slow releasing due to the outer layer having to melt and then the bomb bit in the middle is also slow fizzing so you get loads more from it. Best photies!! I love easter, and will be buying quite a few of these when I go to Cpt tomorrow! Thank you, Ronel! 🙂 I hope all are still in stock! Pot Of Gold sounds amaaaaaaazing! Love your trick for the shower jelly, going to try it out tonight thanks! Jippie, jippie, ek gaan nou-nou Canal Walk toe en gaan verseker daar n draai gaan maak. Die Kaap wys vanoggend dat die winter oppad is, so ek gaan solank begin opgaar vir al daai lekker warm bad aande wat voorle! You never stop amazing me!!! I seriously love your blog posts!! Your descriptions are spot on and definitely entices one to purchase the product even if you don’t need it! Beautiful photos! 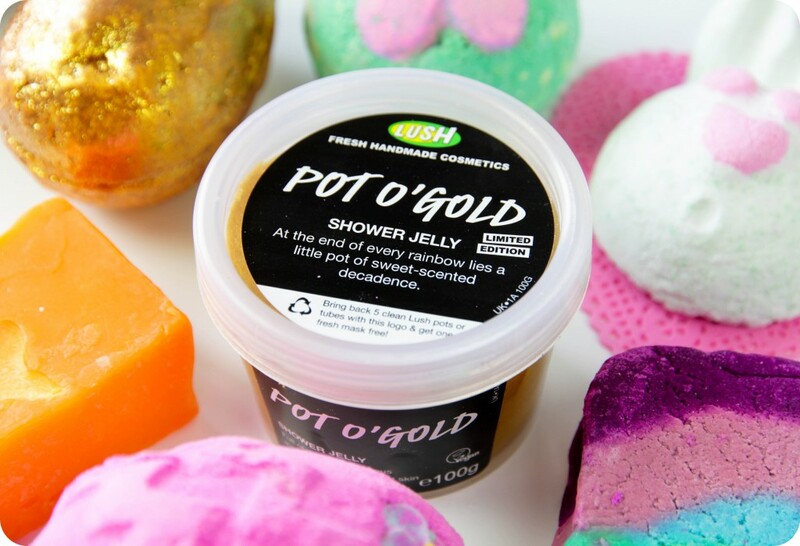 Would love to try the Pot O’Gold Shower Jell, the smell sounds so refreshing! What a cute little guy he is, and the smell of caramel…… sounds yummy! These goodies seem good enough to eat… I’m sure if you just wana browse, its better to pop into Lush than to a pattiserie, the products here are brighter.more colourful and better eye candy than any bakery. What an eye teaser! Love it!